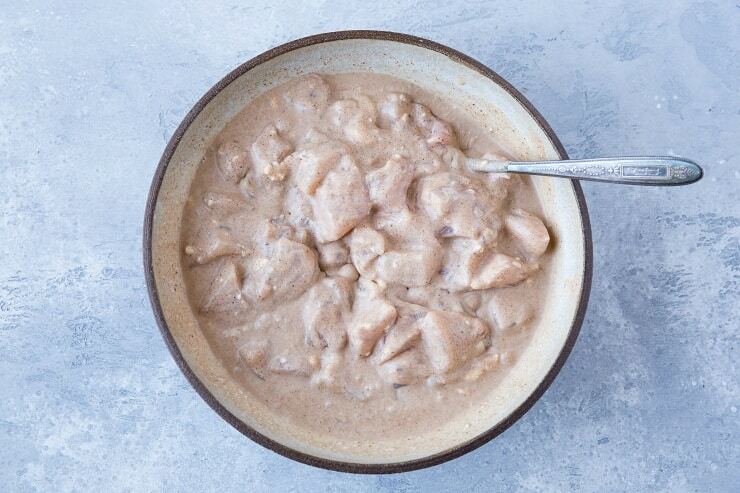 A deliciously authentic tasting paleo chicken tikka masala recipe made easily in your pressure cooker! This amazing tender chicken stewed in aromatic sauce tastes just like restaurant-style chicken tikka masala. Preparing Indian food at home has been a hobby of mine for years. The aromatic flavors, the scent of cooking with an array of spices, the process of getting a dish to taste just like the authentic version is a beautiful sensory experience – and a very welcome challenge! 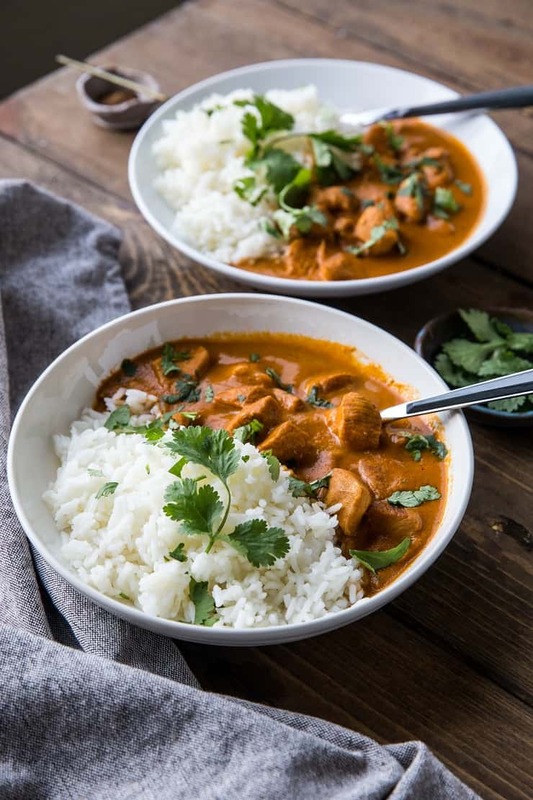 If you’ve been following The Roasted Root for many moons, you may even remember my Crock Pot Chicken Tikka Masala, which broke the internet back in its hay day. 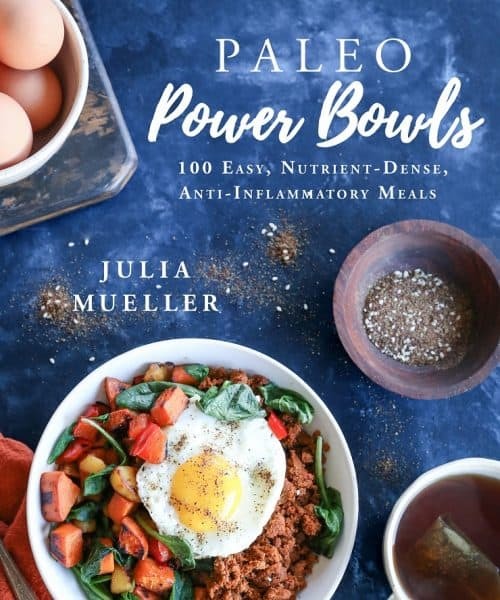 Because it’s been a long time since we have Tikka Masala-ed together, I thought I would re-visit the subject paleo-style in the Instant Pot. The traditional version of Chicken Tikka Masala uses yogurt for marinating the chicken and sometimes calls for heavy cream in the sauce. I replace the dairy using full-fat canned coconut milk and the result is sinfully delicious. Plus, when all is said and done, this restaurant-style Chicken Tikka Masala tastes remarkably authentic. I’m willing to bet it will become a staple in your household! 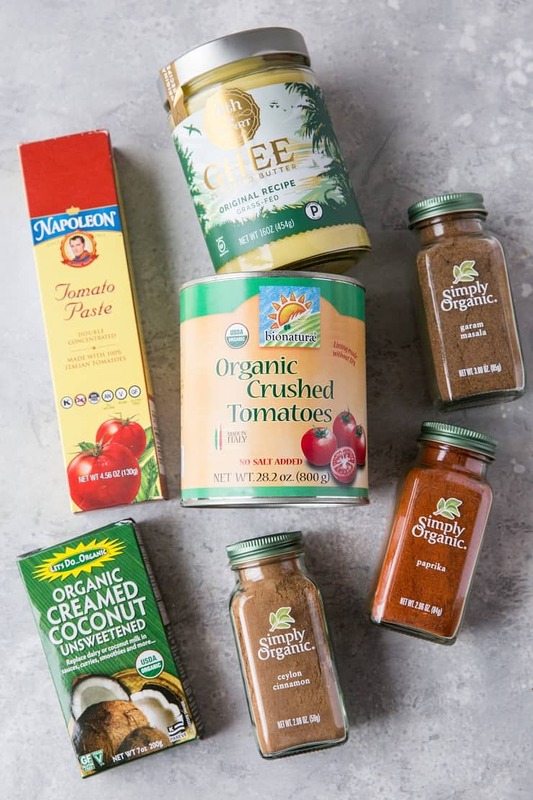 To prepare the recipe, I picked up some pantry staples off of iHerb.com. If you haven’t used iHerb yet, here’s the rundown. iHerb is a global leader in bringing the best overall value in natural products to customers worldwide. iHerb’s triple guarantee ensures that 1.) You will receive the best overall value in the world for over 30,000 brand name natural products, 2.) Guarantees that all products are authentic brands sold in the U.S. market and are shipped directly from climate-controlled warehouses, and 3.) Guarantees delivery of your order! – They provide free or discounted shipping to over 150 countries around the world. To make this Instant Pot Chicken Tikka Masala, I used 4th & Heart Ghee, Bionaturae Organic Crushed Tomatoes, Edward & Sons Organic Creamed Coconut, Napoleon Co.Tomato Paste, Simply Organic Garam Masala, Simply Organic Ceylon Cinnamon, and Simply Organic Paprika, all of which I snagged off of iHerb. 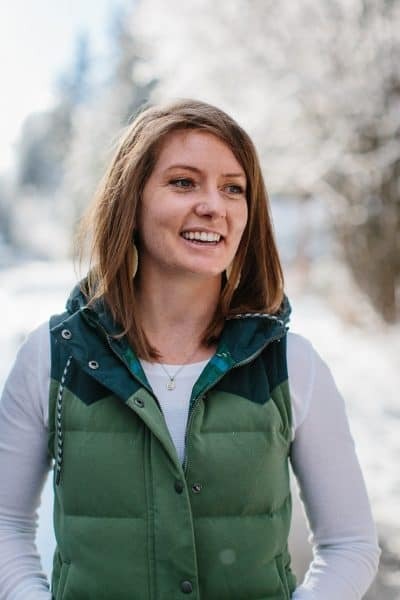 I enjoy the convenience of getting all my cooking items from one spot, which can be a challenge when you cook using ingredients that aren’t available at all grocery stores. Start by marinating the chicken in coconut milk and and the spices. 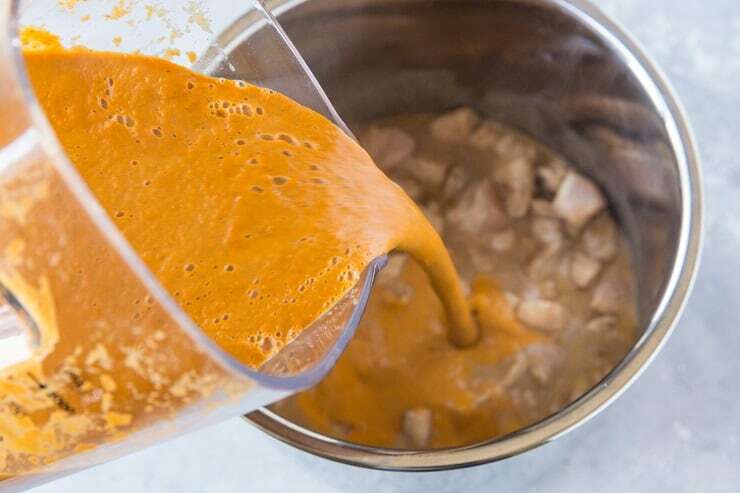 While the chicken is marinating, prepare the tikka masala sauce. To do so, start by sautéing the onion in ghee. Add the spices and continue sautéing another couple of minutes to open up the flavor of the spices. Add the remaining ingredients for the sauce and bring to a gentle boil. 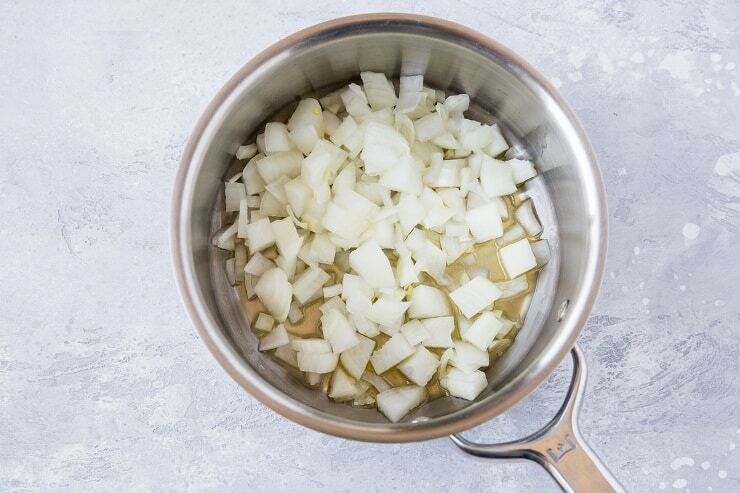 Simmer the sauce for at least 15 minutes – you can absolutely simmer for longer to achieve deeper flavor if you have the time! 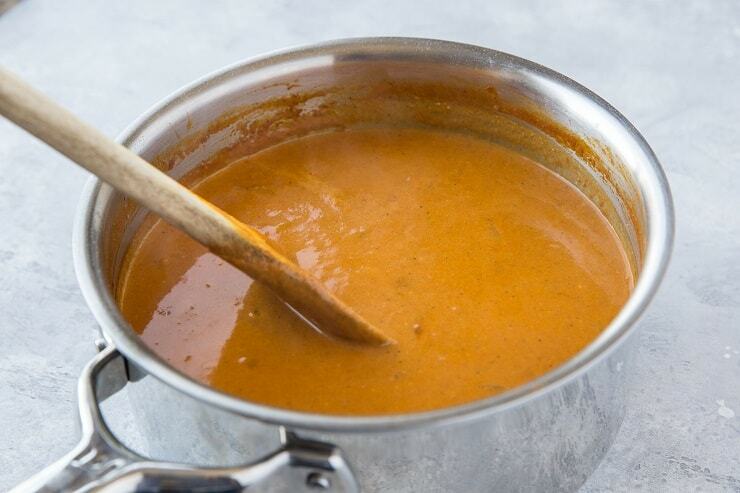 Use an immersion blender or a regular blender to blend the sauce until it is completely creamy. Turn on your Instant Pot (or pressure cooker) to the Sauté function and allow it to heat up for a couple of minutes. Add the chicken, including the marinade and brown it for 3 to 4 minutes. 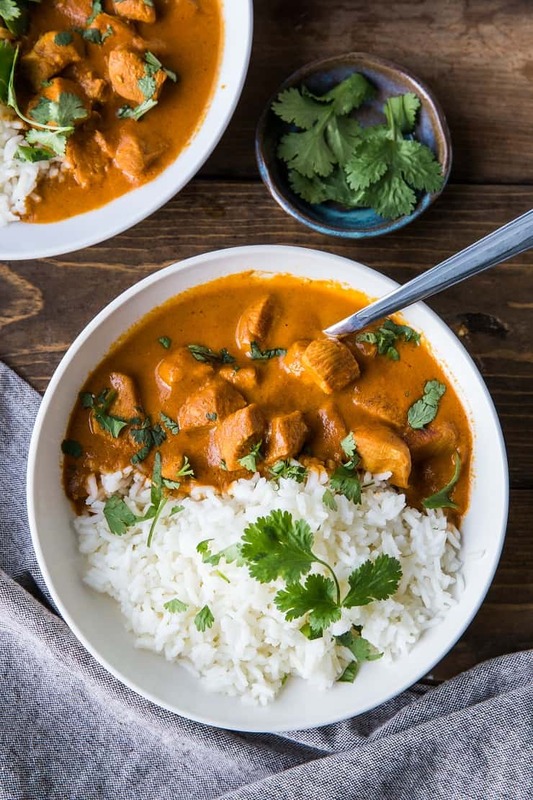 Pour in the tikka masala sauce, secure the lid on the Instant Pot, select the Pressure Cook function and change the power to Low. Keep the pressure release valve set to Sealing (not Venting). Cook for 35 minutes, then allow the Instant Pot to go into Keep Warm Mode for an additional 20 to 30 minutes. Release any remaining pressure by using the quick release valve. And that is it! Serve it up over your choice of white or brown rice, or go full-tilt grain-free by serving it with cauliflower rice. For those of you who love Tikka Masala but don’t have spare time to make the sauce yourself, iHerb offers options for pre-made sauces (not just Tikka Masala), such as Kitchens of India, Punjabi Tikka Masala. All you would do is use this sauce in place of making your own, following the recipe instructions as normal. Great news! New and Existing Customers of iHerb get a discount on their order with no minimum purchase by CLICKING HERE. 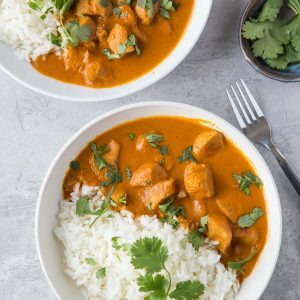 I hope you love this Instant Pot Paleo Chicken Tikka Masala as much as I do! 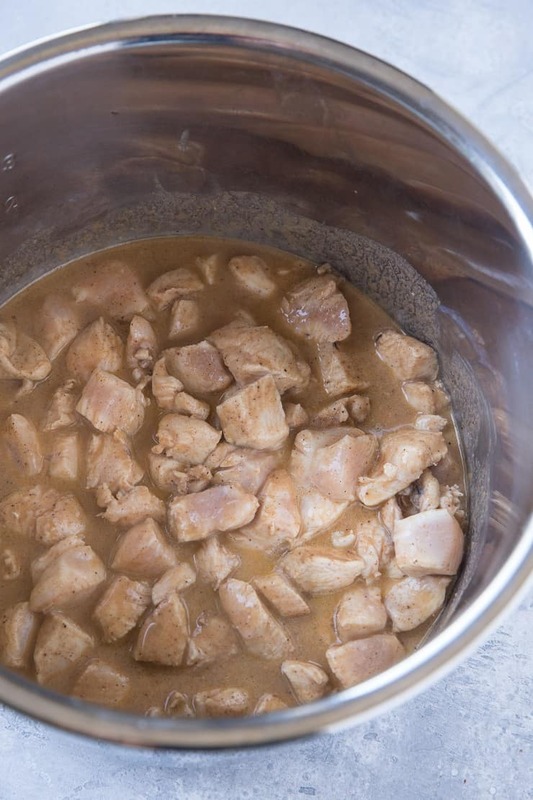 Stir together the ingredients for the chicken marinade in a mixing bowl, then add in the chopped chicken. Stir until all of the chicken is saturated in the marinade. Cover with plastic wrap and refrigerate at least 15 minutes (ideally 1 to 8 hours). While the chicken is marinating, prepare the tikka masala sauce. To do so, start by sautéing the onion in ghee. Saute 5 to 8 minutes, until onion is translucent. Add the garlic, ginger, and spices and continue sautéing another couple of minutes to open up the flavor of the spices. Add the remaining ingredients for the sauce and bring to a gentle boil. Simmer the sauce for at least 15 minutes – you can absolutely simmer for longer to achieve deeper flavor if you have the time! 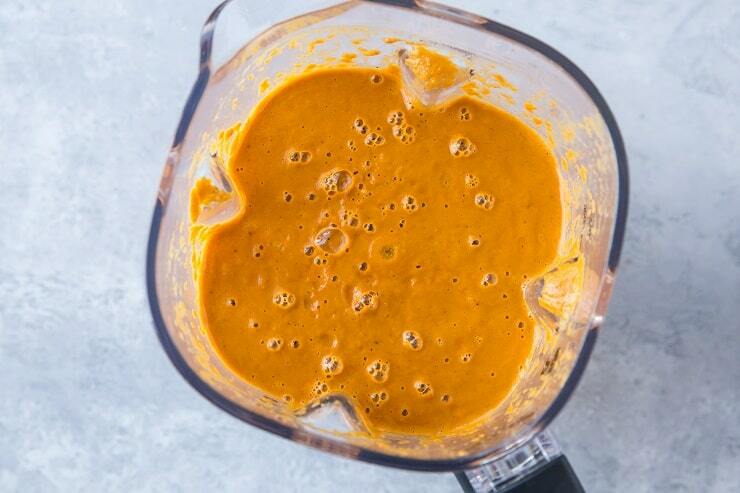 Use an immersion blender (or transfer to a regular blender) to blend the sauce until creamy. Pour in the tikka masala sauce, secure the lid on the Instant Pot, and select the Pressure Cook function. Change the setting to Low, and keep the pressure release valve set to Sealing (not Venting). Cook for 35 minutes, then allow the Instant Pot to go into Keep Warm Mode for an additional 20 to 30 minutes. Release any remaining steam using the quick release valve. 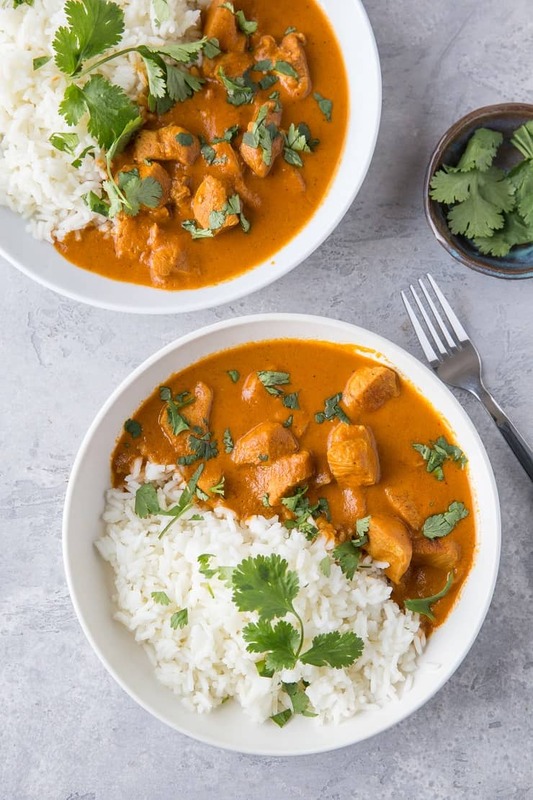 Remove the lid on the Instant Pot and serve Chicken Tikka Masala with choice of rice or cauliflower rice. Going to have to try this! Quick question though – why didn’t you make the sauce in the IP? Seems like it could have minimized cleanup ! Do u mean manual for 35 minutes. Won’t that dry out chicken?? It’s 35 minutes on the Low Pressure Cook setting 😀 I promise, it turns out great! If you’re concerned about the chicken drying out, you can decrease the time, but 35 minutes worked wonders for me. Let me know how yours turns out! This sounds fabulous! When using full-fat canned coconut milk in your recipes (and the recipe does not call for the entire can) do you mix the cream and liquid together or just use the cream?